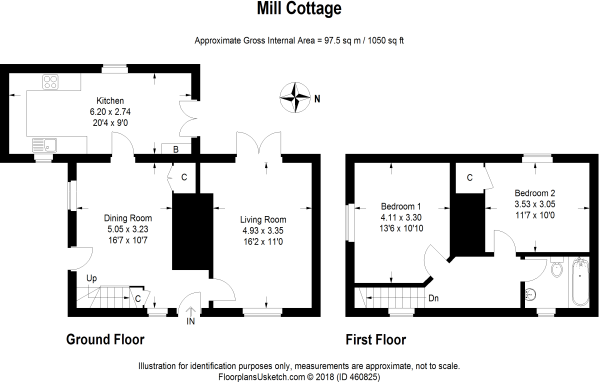 DESCRIPTION A charming semi-detached MILL COTTAGE ideally situated close to the canal, pub, Kintbury village centre and railway station. The accommodation comprises entrance hall, living room with FIREPLACE and double doors to the terrace, a large dining room and a fitted kitchen/breakfast room on the ground floor with TWO DOUBLE BEDROOMS and a bathroom with bath and shower over on the first floor. The garden enjoys plenty of sunshine and offers an attractive circular terrace, surrounded by an extremely well stocked garden. The enclosing wall provides a particularly private and sheltered area and there is a further terrace on the west side of the cottage which sees the afternoon sun. There is off-street parking in front of the cottage. LOCATION Kintbury (recently voted the 19th best village in the country to live in) is located some 5½ mile to the west of Newbury and just over 3 miles from Hungerford. It is set at the foot of the North Wessex Downs in stunning countryside with picturesque walks. Kintbury lies within a few miles of junction 13 of the M4 to the north of Newbury and the village has its own railway station linking to Reading and Paddington. This very active village is set on the banks of the Kennet & Avon Canal and has local shops, schools, pubs and recreational centre and a tennis club. Disclaimer - Property reference 102588023420. The information displayed about this property comprises a property advertisement. Rightmove.co.uk makes no warranty as to the accuracy or completeness of the advertisement or any linked or associated information, and Rightmove has no control over the content. This property advertisement does not constitute property particulars. The information is provided and maintained by Jones Robinson Estate Agents, Berkshire & Wiltshire. Please contact the selling agent or developer directly to obtain any information which may be available under the terms of The Energy Performance of Buildings (Certificates and Inspections) (England and Wales) Regulations 2007 or the Home Report if in relation to a residential property in Scotland.